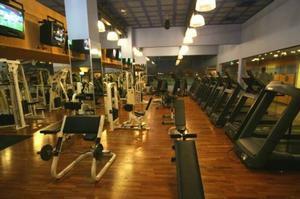 At Club Hotel Spa and Gym Center at your service Four Jacuzzi pools, wet and dry Sauna Rooms. The “Gym Club” offers various massages: Swedish – classical, Shiatsu, and a variety of enjoyable treatments provided by a well trained professional team. An advanced indulging "Gym Club" and Spa - A modernized and computed shape room and a 'spinning' (cycling) hall. The hotel holds an entertainment Conference halls -"20 thousand miles under the water auditorium" shaped as a roofed theater, containing about 900 seats and about 600 seats around tables. The hall is equipped with high tech audiovisual equipment for conferences and various events. The multi-purpose 'Ocean' hall holds about 700 seats theater shaped and about 500 seats around tables. Club Hotel's drugstore is located on the Lobby grounds near the reception desk offers variety of gifts, souvenirs, notion materials, cosmetic products, newspaper and more. A magnificent synagogue for the use of our religious guests holds 200 seats. At your service Supermarket - 2 super club stores are located at the hotel grounds offering variety of fresh fruit and vegetables, variety of food products and prepared meals. The hotel serves a rich buffet breakfast, in addition to a café and a fast food restaurant where breakfast, lunch and dinner can be enjoyed. Next to the swimming pools are snack carts and light food. The hotel also supplies all needs to guests wishing to cook for themselves: supermarkets with fair prices for cooking products and prepared meals for heat and serve. Studio Room - A double room with adjusting beds and without a living room. An accessorized kitchenette including: a microwave, an electric kettle, a small fridge and cutlery for the number of guests in the room. A dining room, bathroom and bathtub also used as a Jacuzzi, a balcony with two resting chairs. Suitable for a couple or for a couple with one child. *a studio accessible for handicapped is also an option. 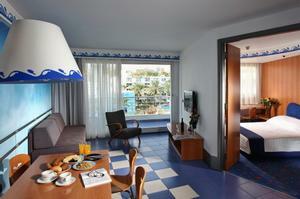 Club-Hotel Suite - A bedroom and a living room with a double bed, a toilet corner. A sofa opens to a double bed and another folded single bed. An accessorized kitchenette including: a microwave, an electric kettle, a small fridge and cutlery for the number of guests in the room. 2 T.V’s a balcony with 2 resting chairs, bathroom with bathtub. Suitable for 5 guests. *a studio accessible for handicapped is also an option. Deluxe suite - A spacious bedroom and a living room with a double bed, a toilet corner. A sofa opens to a double bed and another folded single bed. An accessorized kitchenette including: a microwave, an electric kettle, a small fridge and cutlery for the number of guests in the room. 2 T.V’s a balcony with a Jacuzzi, bathroom with bathtub. Suitable for 5 guests. Caribbean Suite - 2 bedrooms and a living room –a parents room with an adjusting double bed, with bathroom and bathtub + additional toilets and shower next to the children’s’ room (2 separate beds). A sofa opens to a double bed and an accessorized kitchenette including: a microwave, an electric kettle, a small fridge and cutlery for the number of guests in the room. 2 T.V’s a balcony with a Jacuzzi + 2 tanning beds. Suitable for 6 guests. Presidential Suite - A grand luxurious suite containing two bedrooms, a study room, lathered living room with a stereo system, DVD and a bar. Two fully accessorized bathrooms, a large Jacuzzi and a large wooden balcony with a Jacuzzi. Eilat Club Hotel is the largest suites hotel across the Middle East and the only hotel across Israel designed and built under the inspiration of the sea. 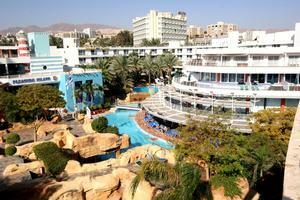 Eilat Club Hotel is a resort located next to the entertainment and shopping center of Eilat and next to Eilat's Mall. The hotel lies upon a wide area of 10 acres, 3 out of them are of a water park and a rich tropical garden with enchanting waterfalls. The Club Hotel entertainment team will be delighted to entertain you during your stay with a variety of activities for adults, spectacular shows and activities for children, during day and night time. In short, everything you need in order to make your vacation a successful one.